Fans & followers of Travel & Leisure nominated their favorite towns on social media platforms, then ranked them according to various categories such as farmers' markets, hotels, museums, adventure, dining, etc. T&L then tallied the results and determined the overall order. Burlington ranked #9 of 744 nominated towns based largely on its strong local foodie culture. A thriving farmers' market, farm-to-table movement, diverse restaurant selection and numerous cafes no doubt played a strong role in the voting! Also weighing in is Burlington's access to year-round adventure & outdoor activities: from hiking to skiing, biking to boating - the Green Mountains and Lake Champlain give Vermont all around access! 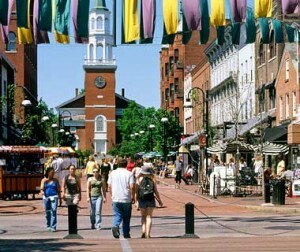 Interested in living in Burlington VT? Check out some Burlington properties today! Prefer lakefront properties only? Try searching HERE! Traveling to Burlington in the near future? Give me a call and we can set up a property tour based on your criteria!